Do you want to import your photos from Dropbox to WordPress galleries? Often photographers use Dropbox to store their images in the cloud. However downloading the photos and then uploading to WordPress media library can take hours. In this article, we will share how to import your images from Dropbox to WordPress gallery in just a few clicks. By default, WordPress media library does not allow you to import your photos from Dropbox to WordPress image gallery. However, we at Envira Gallery added this important feature because many of our readers requested it. 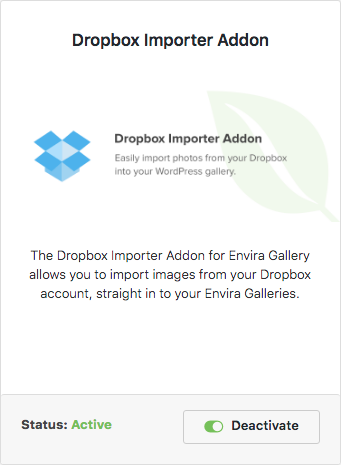 You can easily import your Dropbox photos to image galleries in WordPress using the Envira Gallery plugin. 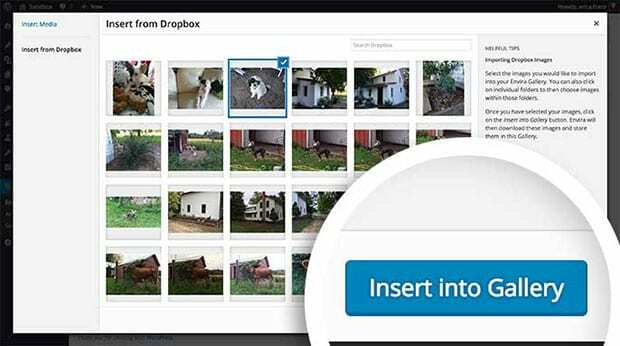 After activating the plugin, you will need to install Envira’s Dropbox Importer Addon that will allow you to import your dropbox photos to image galleries in WordPress. You can simply go to Envira Gallery » Settings. Next, click on the Addons tab to install and activate the Dropbox Importer Addon. Upon activating the addon, you can find a new Dropbox tab in the Settings screen. Go to this tab and click on the Get Code button. You will see a Dropbox screen for authentication. 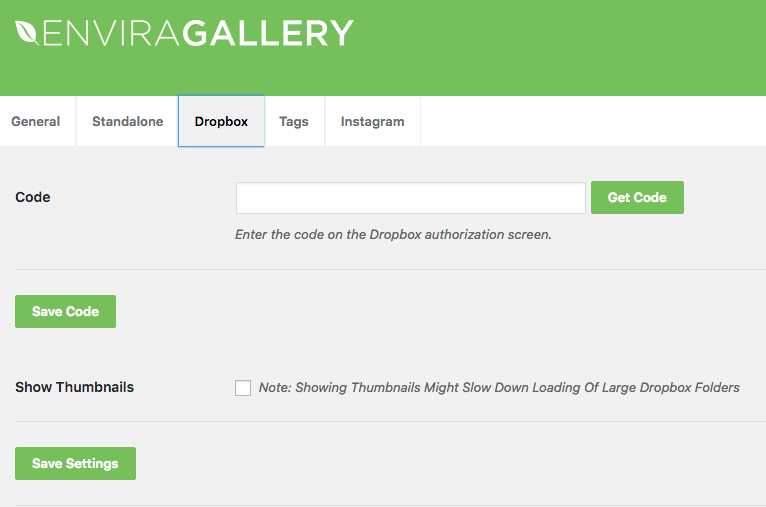 Click on the Allow button to authenticate Envira Gallery with your Dropbox account. You will get the code which you need to copy for the next step. Go to Envira Gallery » Settings » Dropbox and paste the code. Once done, click on the Save Settings button. After this process, you can go ahead and edit your image gallery where you want to add the photos from your Dropbox account. You need to hit the Click Here to Insert from Other Image Sources button. 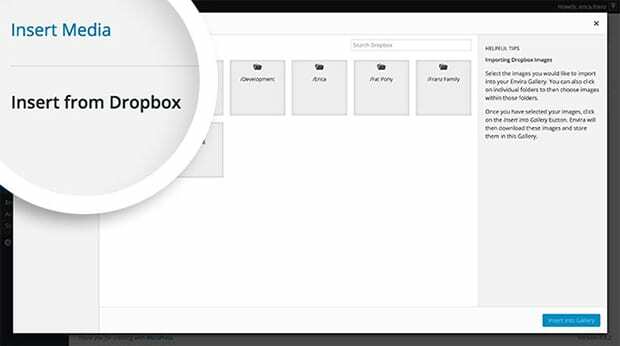 A popup will appear where you have to select the Insert from Dropbox option. It will show all your images and folders from Dropbox that you can use to create an image gallery in WordPress. Once you select the images, you need to click the Insert into Gallery button. That’s all. Make sure to press the Update button or Publish your gallery. After that you can visit your website to check your new image gallery. 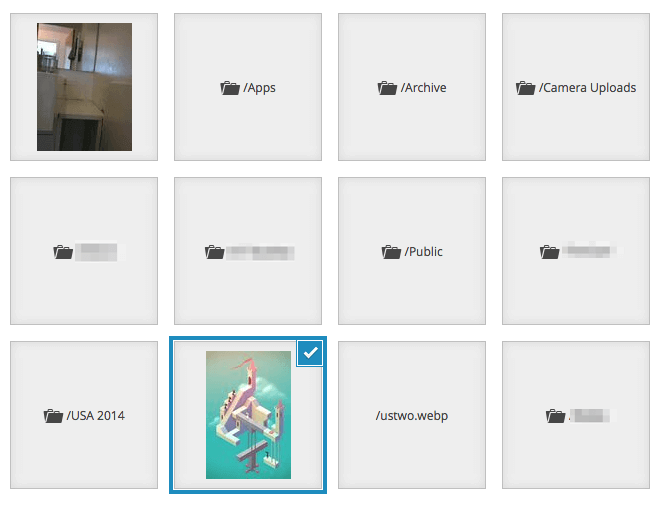 We hope this article helped you import your Dropbox photos to WordPress image galleries. You may also want to check out our guide on how to create password protected image galleries in WordPress. Thank you for pointing this out, but I do have a question regarding the plugin. I bought Envira Gallery (and installed the Dropbox plugin), but noticed an error while trying to use Dropbox. Something with not having 64-bit integers in PHP. I use an iMac with 64-bit architecture and even my iPad has 64-bit support (if I am not mistaken). Any ideas what might cause this? You’ll want to check with your host about configuring the server and PHP to be 64-bit. Make sure that both hardware and PHP will need to be 64-bit or this error can occur. There is no free version please ? Of course the source-URLs of the images should be publicly accessible or at least provide a link that only Envira-Plugin would be able to use. This would enhance the whole process of managing images, public-galleries and client-galleries enormously. Is this possible with the Pro-Version of Envira? Ah, sure, thank you for the link! Linking the images to another storage like Dropbox. Exactly what we are looking for in the times of exploding storage amounts! Is it possible to import multiple images at once without selecting each single image from within a dropbox folder? It seems possible if you click on each photo and the Insert. But I wonder how to bulk select a bunch of photos at once, e.g. by keeping “shift” or “cmd” pressed and then only click on the first photo and the last one of those which I want to insert. So that all photos located between the first and last photo are automatically selected too. This seems not possible. It’s also not possible to import a single dropbox-folder regardless how many pictures are inside this folder. This is a shame for photographers and others, who want to migrate large volumes from their dropbox into their Envira gallery. At least it should be possible to insert photos from uploads-folders via Envira directly, in order to avoid upload-limits caused by the hosting-provider. Hey Sushi, why don’t you suggest this to our team? We are known to deliver the best. 🙂 Make your suggestions here. Have Sushi’s and Christian’s requests been implemented yet?